FUN with WEATHER!! Activity Pack! PLEASE CLICK PREVIEW FOR MORE DETAILS! 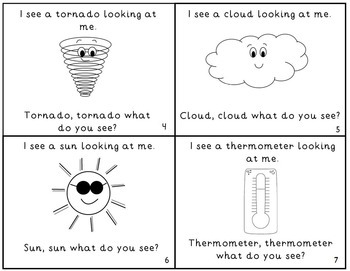 LEVEL 1-"My Weather Counting Book" is a simple reader that counts different weather words 1-10. LEVEL 2-"Rainbow, Rainbow What Do You See?" follows the "Brown Bear Brown Bear" pattern. 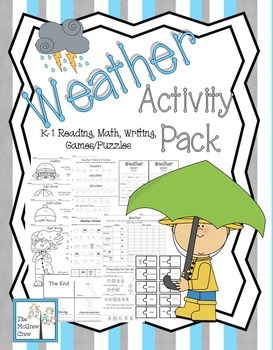 A good book with repetition and focuses on weather vocabulary. LEVEL 3- "Windy Day, Windy Day What Do You See?" This is similar to the level 2 book but is a combination of level 1 & level 2. LEVEL 4- This is the level 3 book, but each page has one word missing. Students use clues on the pages to fill in the missing words. 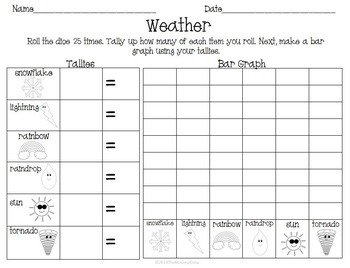 •3 estimation jar pages with student worksheet and demonstration pages. •1 domino game set (24 dominoes). Print on card stock and laminate or glue onto cardboard for sturdier dominoes. 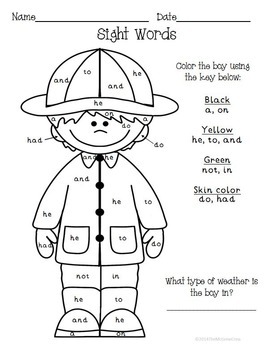 •1 vocabulary puzzle-can be used as a match game in centers, or glued onto paper or into a journal to review/practice weather vocabulary. Great for Kinder and First!